Red Ribbon Week began after the brutal murder of Drug Enforcement Administration Agent “KiKi” Camarem in 1985. He was working undercover in Mexico and was murdered after he uncovered a multi-million dollar narcotics manufacturing operation in Mexico. Red Ribbon Week is celebrated in his memory. 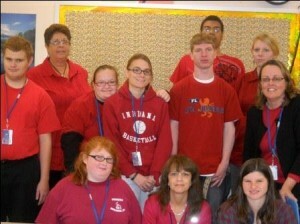 By wearing red during the last week in October, we demonstrate our opposition to drug abuse. Many of us have family members and friends who are struggling with addiction. Students and staff supported the effort to oppose drug abuse by wearing RED on Friday, October 28. The 2nd block group with the highest percentage of students wearing read won a free breakfast! Mrs. Bowden’s class had 100% participation!